BOSTON, MA--(Marketwired - Apr 27, 2017) - ViralGains, the industry's only video advertising journey platform, today announced the opening of its new office space in downtown Boston. The move reflects the company's strongest year ever, with YOY bookings growth of 141 percent from 2015 to 2016. Record growth demonstrates the increasing demand for its video solutions that allow marketers to truly engage consumers. 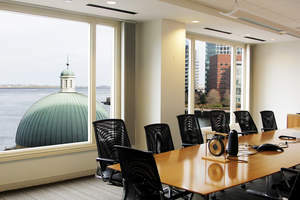 The new headquarters, located at 50 Rowes Wharf, will support team growth and company expansion as ViralGains doubles its investment in product innovation, data science, and engineering. "We are experiencing rapid growth because our platform ensures that advertisers know where their video is appearing and that people are truly engaging with their message in meaningful ways," said Tod Loofbourrow, CEO, ViralGains. "We are seeing bigger budgets that traditionally went to Facebook and Google as brands realize video is different -- it isn't about 2 second views or impressions, it is about meaningful engagement and sales." ViralGains supports 59 of the Fortune 500 in its brand line-up roster, including four of the top five auto manufacturers. Additionally, 71 percent of its business in Q1 2017 is from recurring customers, and 2017 year to date growth is already 162 percent higher than 2016. The ViralGains team doubled since 2015 and the company recently opened two additional offices in Detroit and San Francisco -- expanding ViralGains' presence to six key markets in the U.S.
ViralGains' growth is largely attributable to its unique ability to help brands create authentic connections: viewability, attention, length of view, two-way conversation, engagement, social sharing and more. With ViralGains, video stories are not limited to a single campaign, it's about a series of videos delivered throughout the full customer journey. ViralGains does this with a suite of data products that ask people what products they want and how they feel about a brand. The collection of attitudinal and behavioral signals provides real-time data and insights that inform future campaigns and optimize results based on true engagement, delivering qualified prospects with a high propensity to buy. ViralGains is a video ad journey platform that enables marketers to engage people with relevant brand stories in the contexts that people most favor. Using the platform to engage in a two-way conversation, brands discover exactly what people want -- and how they feel -- and build a unique journey that connects highly qualified consumers with relevant messages that generate awareness, motivate intent, and impact purchase decisions. ViralGains is headquartered in Boston, with regional offices in Chicago, Detroit, Los Angeles, San Francisco, and New York. For more information, please contact us at www.viralgains.com.